VANCOUVER -- Consecutive early exits from the Stanley Cup Playoffs cost Alain Vigneault his job as coach of the Vancouver Canucks. After the Canucks finished one win short of their first Stanley Cup in 2011, president and general manager Mike Gillis cited first-round exits in the past two seasons, including a sweep by the San Jose Sharks two weeks ago, for the decision to fire Vigneault and assistant coaches Rick Bowness and Newell Brown on Wednesday. "We're in a results-oriented business, and if you look at the last two playoffs that we have been in, we were the higher-seeded team that lost the first two games at home," Gillis said during a news conference. "There comes a point in time where the message has to change and we have to be better. We simply didn't get the result that we expected, and in this business you have to get results." After getting to Game 7 of the Cup Final in 2011, where Vancouver lost to the Boston Bruins, Vigneault coached the Canucks to a second straight Presidents' Trophy as the top regular-season team in 2011-12, only to be eliminated by the eighth-seeded Los Angeles Kings in five games in the first round. That prompted calls for the coach's job last summer, but Vigneault instead received a two-year contract extension from the Canucks on May 23. The Vancouver Canucks had far more highs than lows under Alain Vigneault, who was fired as coach on Wednesday after his team was swept in the opening round of the Stanley Cup Playoffs. Almost exactly one year later, a similar "thorough review" by Gillis led to the dismissal of the franchise's all-time leader in coaching wins and winning percentage. "When you see that the previous season, we thought it might be an anomaly," Gillis said. "We wanted to make sure they had every opportunity they could to succeed, and in a lockout-shortened season it's difficult, but in the playoffs we got the same result. I believe we have a good hockey team and I believe we had opportunities to win. We have a good hockey team. We didn't get results." The playoffs are perhaps the only area in which Vigneault came up short during his seven seasons in Vancouver. The Canucks made the playoffs six times, winning the Presidents' Trophy twice and six Northwest Division titles. Vigneault had a 313-170-57 record, including a team-record 54 wins and 117 points in 2010-11. "I am proud of many of the things we accomplished as a group these past seven seasons in Vancouver and only wish we were able to win the Canucks' first Stanley Cup," Vigneault said in a statement released by the team after Gillis spoke. "I am a career coach and it is what I love to do. I hope to coach again in this League and will always have good memories of my time and the fans in Vancouver." Vigneault also leads the franchise in career playoff wins. But under his direction, Vancouver split 12 series, including four losses with home-ice advantage, and has one win in its past 11 games since winning Game 5 of the 2011 Final. After being one of the NHL's highest-scoring teams the previous three seasons, Vancouver struggled to score in 2012-13, falling to 19th in goals -- and the goal drought continued for a second-straight postseason. The power play, which was near the top of the League for the past two seasons, fell to the bottom this season, with prized free-agent acquisition Jason Garrison left off the point of the top unit despite a 100 mph slap shot and 16 goals with the Florida Panthers in 2011-12. Gillis talked shortly after the sweep by San Jose about needing an organizational reset that would include getting younger, bigger and cheaper up front. But he admitted Wednesday that coaching was the easiest place to start. "That's the most immediate and logical change you can make, I believe," Gillis said. "But I also think we need to do more in terms of where we are headed as a group and as an organization. It's not one person. It's all of us. We all bear responsibility. We all played a role in this kind of outcome." Assistant coach Darryl Williams, who is in charge of video, and goaltending coach Roland Melanson remain with the team. In three seasons, Melanson made key style changes with Roberto Luongo and Cory Schneider. "Rollie works very well with Cory Schneider," Gillis said of retaining Melanson, who coached alongside Vigneault with the Montreal Canadiens from 1997-98 to 2000-01. "You can't look at our goaltending over the past few seasons and look at that as a negative." The deployment of Luongo and Schneider, however, has been questioned. "We're in a results-oriented business, and if you look at the last two playoffs that we have been in, we were the higher-seeded team that lost the first two games at home." Vigneault switched from Luongo to Schneider two games into the 2012 Stanley Cup Playoffs, leading to widespread speculation Luongo would be traded. Instead, Luongo was back in goal to start this year's playoffs after Schneider, who started 30 of 48 regular-season games, injured his groin late in the season. Although Luongo played very well in Games 1 and 2, and Schneider going almost two weeks between starts, Vigneault switched back to Schneider for Game 3 -- but Schneider struggled at times in the final two games. "I have been very critical of myself, but coaches coach and managers manage," Gillis said. "We try our hardest to provide the best players we could. … Alain has been a great coach here, he's a terrific person, but in our evolution it is time." 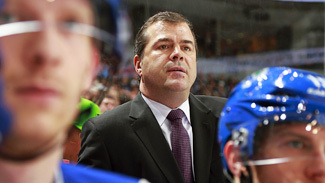 Vigneault preceded Gillis in Vancouver by two seasons. Vigneault won the Jack Adams Award as the NHL's top coach in his first season, 2006-07 but missed the playoffs after a late collapse the following season. Many expected Gillis to make a coaching change after taking over as general manager in 2008. Instead, after another long review, Vigneault stayed -- and lasted five more seasons. "We found a way we could work together. We were successful together," Gillis said. "It's been a solid five years -- in fact, I believe it's been the best five years in the history of this franchise in terms of winning percentage and getting to the Stanley Cup Final, but the past two years we haven't done the job." Wednesday, that cost Vigneault, Brown, and Bowness their jobs.